When we met with Little Elvis' teacher last week, I was kind of taken aback by her comment that he does the right thing. What did she mean? If the other kids started cutting up, or laughing when they weren't suppose to, he wouldn't. He makes good choices in her class. Now he's not an angel at home, but he does try to do the right thing. He's glad to sit behind Cheese Puff while I go into another room. He will sometimes share with Baby Plum. He has begun to ask Baby Plum for things, and will then say thanks. Last week, he must have gotten into a fight with a new buddy. He said the boy was a bad guy. It took me a while to figure it out, but I think he decided that the little boy acted up in class. He may not look very much like me, but my child has inherited my goody-two-shoeness. It wasn't fun as a little girl, and possibly will be worse for a boy. We'll see. While Little Elvis is no doubt an entertainer who absolutely loves being the center of attention, he's also very caring. 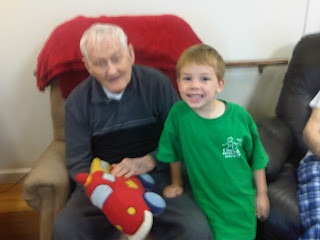 Here he is with my grandfather. Pappy has Alzheimer's, and while I know Little Elvis doesn't understand what's going on, he's usually very kind to Pappy. They used to throw a ball together. Here, Little Elvis let Pappy hold Firetruck (favorite toy by far.) Little Elvis isn't scared of Pappy. A friend and I were talking last year about what types of jobs we could see our kids doing, and I mentioned how great Little Elvis was with Pappy. While I know our child loves entertaining, I think working in a profession that cares about others might be in this sweet boy's future. That's such a great thing to hear from a teacher! My heart swells a little bit for you! so glad to hear those good things! may he always be compassionate. Party Plum is in the house!